Get the latest news about Dutt & Wagner and Green Valley Poultry Farm - wholesale food distribution company and Virginia's top shell egg producer. It can take up to 21 days for a chick to emerge from its egg to then embark on a journey that takes it from a small source hatchery in Blackstone, Virginia to our pullet house here in Abingdon, VA. From day one, we see potential in our chicks. Like proud parents we care and nurture for our young flock until they become vibrant and healthy birds ready to provide eggs to a region that includes over 26 million people. We invest in our chickens because we know that happy chickens create a good product that our customers depend on in their daily lives. Understanding the fruits of this simple investment is the reason why we have called Abingdon, VA our home for over 80 years. Dutt & Wagner was started by Frank Wagner and his brother-in-law Paul Dutt in 1926 with a $500 loan. The duo started by marketing live poultry and eggs in Pennsylvania and New Jersey but soon realized the need for these goods in the South. 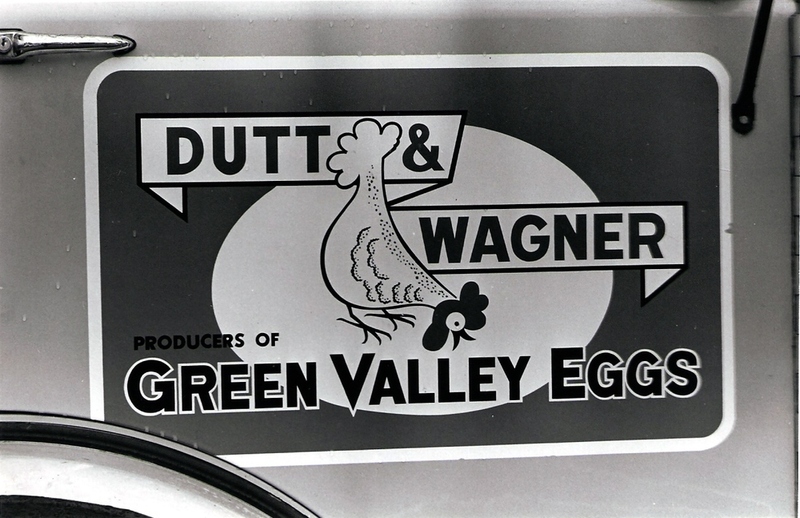 In 1935 Dutt & Wagner opened an office and farm in Abingdon, VA hoping to meet the demand for fresh poultry and eggs for Southwest Virginia and beyond. 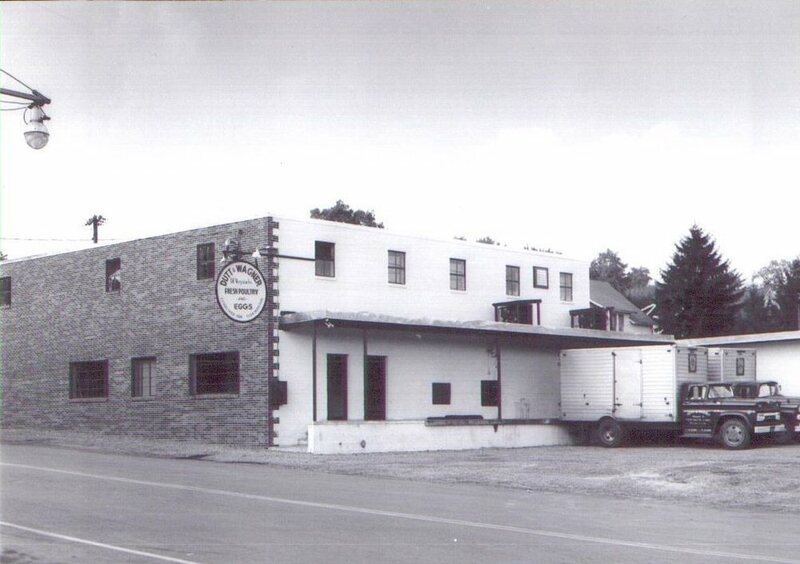 In 1966 a fire destroyed our main office, and the company was forced to relocate. Dutt & Wagner chose to remodel an old bowling alley in Abingdon for their new office location where the company still remains today. Dutt & Wagner actively adjusted to the ebb and flow of the Southwest Virginia economic landscape to expand into a company that not only sells eggs, but meat and food products as well. We are a company that proudly employs 115 hardworking people from farming and production, to sales and distribution. Dutt & Wagner is committed to providing quality products and continuing to grow in the Town of Abingdon. Recently, a plan was proposed by Appalachian Power (AEP) to construct a series of new high power transmission lines to improve the electrical grid in Abingdon and Washington County. While Appalachian Power’s goal was to create a minimally invasive line that does not interrupt any current projects that are underway in the area, the company may not have considered the long term potential and plans of the people and businesses who work on this prime location off of the busy I-81 corridor. Property owners are unable to build any type of structure within 100 feet of the power line, hindering the ability to expand or make improvements on certain parcels of land along the path of the power line. The current proposed path of the high powered transmission lines bisects the property that Dutt & Wagner has called home for 50 years. This splits the contiguous plot that Dutt & Wagner owns into two fragments which greatly reduces the ability for Dutt & Wagner to improve or expand operations within Abingdon. Currently, there is boundless opportunity for this land to be put to good use in ways that can improve our community and build places for businesses that seek to create a more robust economy in Abingdon and Washington County. If the power lines are built on their proposed pathway, this type of potential may cease to exist in such an economically viable location. The view from Dutt & Wagner’s window has changed tremendously over the past 80 years. Our family has witnessed the rise and fall of many industries that Southwest Virginia called home. We have seen quaint general stores become immense supermarkets, and rolling cow pasture become bustling malls. For the past 80 years, we have seen businesses open and close, grow and prosper. We pride ourselves on being a responsible corporate citizen in our community and we are asking AEP to do the same. In order to be a community-based business, one must listen to the members of the community it serves and work together to reach a practical solution that promotes progress for all rather than for some. Dutt & Wagner and other businesses in Southwest, VA work hard to improve, to innovate. It is through this improvement and innovation that we fortify the cultural and economic fabric that makes Abingdon and Southwest Virginia so special. With our longstanding relationship with this region and our deep roots in Abingdon, we have provided our products to so many people and we strive to continue to service our customers for many years to come.